Chili Garlic Hot Sauce 5oz. Hot Sauce → Other Pepper Varieties → Cholula Chili Garlic Hot Sauce 5oz. Cholula Chili Garlic Hot Sauce is a garlic lover's dream. 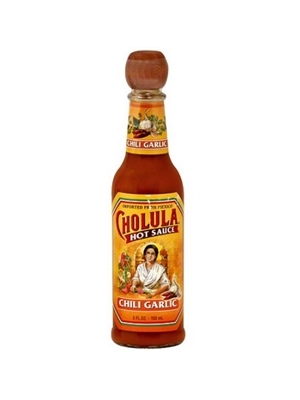 Cholula Chili Garlic gives you the full benefit of Cholula's original Flavorful Fire complimented with an abundant presence of fresh, coarse ground garlic. It is an incredible flavor enhancement to pasta sauces, pizza, poultry, soups and anywhere you would enjoy a little garlic! 5oz.